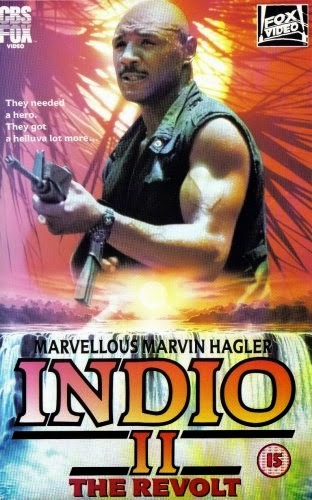 Marvelous Marvin Hagler is back in this sequel that should answer all your questions from the first Indio. This time around, an evil corporation (of course) wants to build a road through the rainforest. Seems logical enough, but it turns out they would be destroying the indigenous land of the Indios. So the head Indio in charge, Ugadi (Cuervo) does the only logical thing you can do in that situation: he turns to Marvelous Marvin Hagler for help. Sorry, Sgt. Iron. Iron leads the local tribes on a massive revolt (hence the subtitle) against the evil mercenary baddies put in charge of building the road. But it all comes to a head when IMC President (that’s all he’s credited as) (Napier) shows up, and then Sgt. Iron goes mano-a-mano with head builder/baddie Vincent Van Eyck (Galuba). Will the revolt be successful, or just plain revolting? Just the fact that there’s an Indio TWO is a testament to the grandness of the video store era. Shelves needed filling, and customers were hungry for product, so, why not? Especially when master director Antonio Margheriti is at the helm once again. The guy knows action, that’s for sure. The movie is very well-shot, and the professional look adds a lot. At first, it may seem like slow going - and at 104 minutes, that is a more than reasonable thing to think - but Indio 2 is like a river in the rural jungles where it was shot. At first it may seem leisurely and rambling, but at some point it becomes rapids and then a waterfall - that really is what happens here. The final third of Indio 2 is simply great. It just takes a little time to get there. Marvelous Marvin Hagler (he legally changed his name to Marvelous Marvin Hagler, much like how Mr. T’s legal name is Mr. T - and for those who don’t know, T’s middle name is legally a period) certainly gives Louis Gossett Jr. a run for his money. Why didn’t they play brothers in a movie? When he speaks to members of the local Indio population, he calls them “man”. Of course, he faces off against an evil German. Halfway through the movie, we’re told he’s supposed to be South African, but his accent is pure baddie. It’s a baddie accent, more than anything. A badcent? His sidekick is a beardo who strongly resembles Mick Fleetwood. So that is scary. We were on Charles Napier watch, and he doesn’t show up until 71 minutes in. That’s a long time. And his screentime is almost Center of the Web-style quick - it’s a glorified cameo. Napier basically plays the role Brian Dennehy did in the first Indio, but gets much less time in the sun. Besides that, you can tell Margheriti and the gang didn’t want to do a complete retread of the first Indio. The surprising fate of that movie’s hero, Daniel Morell, would certainly indicate that. Under-the-radar action movie regular Tetchie Agbayani also returns from the first movie, which was nice to see, and added some continuity. Of course, there are the time honored beat-ups, blow-ups, exploding huts a-plenty, and even a rare form of exploding helicopter - not only is it a double ex-heli, but both are on land and not in the sky at the time. You never see that. George H.W. Bush’s photo is on the wall, and in another scene, there’s a picture of Stallone next to a picture of Jesus. That pretty much sums up the spirit of Indio 2 in a nutshell. Indio 2 is a movie that gets better as it goes along. It all ends with a killer climax, and, despite some slower moments early on, it’s quite good overall and very worth seeing. Also check out a write-up from our buddy, Explosive Action! These all can't be coincidences. Oh! Sounds interesting. Can you tell me any more about that helicopter explosion? Explosive Action: Nice! Great write-up. We will link your review right now. Joe: You're absolutely right. The 1st Indio is First Blood rehashed. This one is more of the same, but it's a lot of fun. Exploding Helicopter: It was a pretty good one, right towards the end of the movie, it was on the ground and not in the air. We will try to write-down more details on any upcoming helicopter explosions we see.